On account of general greyness, a project in limbo, and mother-in-law-visit recovery efforts, Tuesday shall be Catch-up Day. Rey and Johanna ran wild through the corridors of Northrup King Builidng while their folks bid on some bird art. We took home a piece by our friend Paula. Lola Plum Martin, 0, of Des Moines. Lola’s first My Two Dads moment. Aunt Allie loves the babies. And the babies love the pictures. You come to Des Moines, you wear the Apple Boots. Beautiful cookies with a backdrop of toy carnage. Can I has bún chả? St. Paul sled racing with Isobel from back in January. Guess who won? Sledding 09 from Jake, Sarah & Johanna on Vimeo. Turns out Harry Allen a/k/a “the Media Assassin,” doesn’t just lurk around the PE water cooler like Professor Griff, but is, in fact, out there assassinating media ignorance. A short essay on racism in the new Old Navy commercial that white people probably can’t see. Why my local dry cleaner rocks (not only because it’s staffed by teenagers using pre-1970’s technology). I avoid blogging about creative/media/advertising work, but this social networking application by Zeus Jones suggests what can happen when smart ad people divert their energy from helping us to consume more, like to enter a contest. The only weather site I will ever need. My days feel as predictable as the tides lately, which may account for the spottiness of my blog posts. After one year, the Abstract Archive has a boom-and-bust cycle that I’d like to even out. But potty training and Scrabble just aren’t inspiring much exposition. So I record the little things. Like many online, bacon is not far from my thoughts. Scrounging for day-old discounts at a gourmet grocery store this weekend, I found condiments telling me “Everything should taste like bacon,” (and it’s seasoning your favorite website, too). 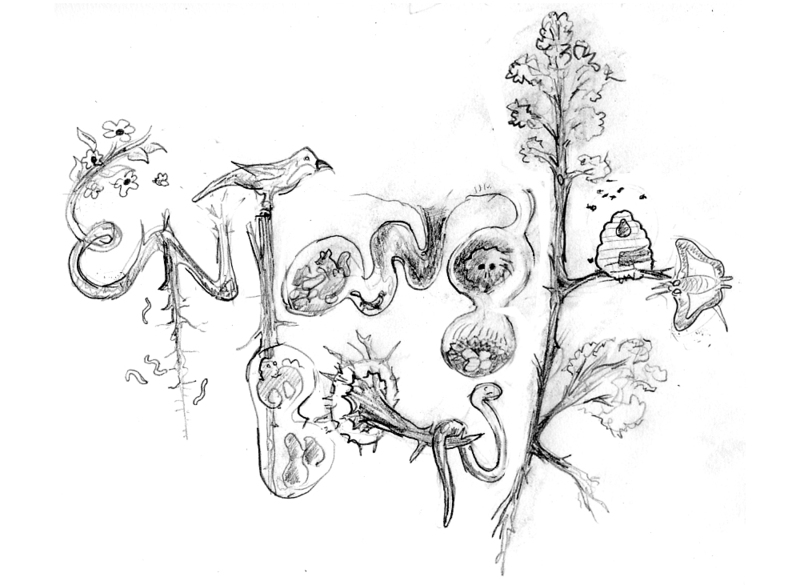 I’ve got a promising illustration going for our friend Rachel’s new blog, Entangled Bank, about evolutionary biology and related topics. There’s a half-completed stained glass piece in my basement workshop (I’m doing a pretzel motif—is anyone else seeing suggestive imagery and layered meaning in knotted bread? No? Well just wait). We had a delightful first encounter with little Lola Plum in Des Moines, worthy of a few posted pics later this week. I leave you with three trips down the YouTube rabbithole courtesy of Kelly P. 1) EvilNine f. Aesop Rock; 2) Bonnie “Prince” Billy (who I’m fortunate to have a ticket to see this month at the Walker Art Center); 3) Butteryass Mondays L.A. tour.